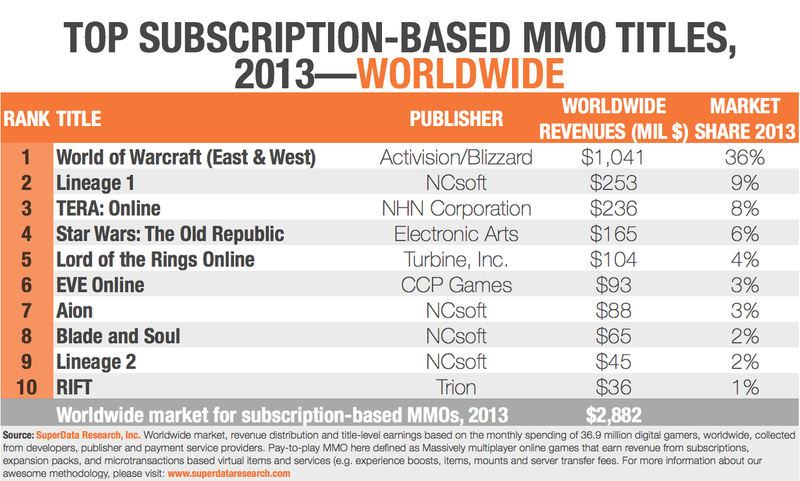 Today, Super Data Research released worldwide revenues for subscription based MMOs. While World of Warcraft sitting tall in the first spot with 36% of the market share for 2013 surprises absolutely no one, what is surprising everyone today reading responses is that STAR WARS: The Old Republic comes in at number four with 6% of the market share. While there is a good amount of criticism about what exactly revenue means here is unknown, it's still impressive to see not just SWTOR, but also Lord of the Rings Online in the top five. With WildStar, Elder Scrolls Online and soon ArcheAge all out this year, who knows what next year will look like. Other criticisms include exactly what Super Data Research is using for these numbers, and if microtransations are included. Super Data Research has been highly criticized for accuracy in the past, since all we, the end user, ever sees are the charts and the data they release, we just don't know where these numbers come from. For all we know, there's a guy rolling a full set of D4 through D20s to come up with these numbers. Whatever it is, congratulations to BioWare and Turbine. One thing that does confuse me, however is that the report is called “US digital games market update” but the chart discusses worldwide revenues. So, which is it? China has different laws for what games can show than the US does, so concluding that the market would be very different between the two countries is a pretty good guess. Are they making June's update to include US numbers, meaning, Lineage 1 is that big of a hit in the US? People are also wondering where Final Fantasy XIV is. While I don't know anyone playing Lineage 1 (or 2 for that matter) personally, I do know a few who are enjoying FFXIV, which leads me to assume that the data is indeed worldwide, but still wondering why it's a US update. For me, the important parts here are the predictions. Super Data Research predicts that the free-to-play market will level off sooner rather than later, as the market becomes so saturated. It seems that there are so many games out there now that are free, but they also all come with a store. Determining which ones are free, but you can spend real money to accomplish the same goals faster, versus which one sare just pay to win can be a frustrating experience of trial and error. Not all so-called pay to win games are just that, but the community has damned them. On the otherhand, there are games that look like you can achieve the same goals in-game without paying a dime, but you end up paying far more than a subscription fee to accomplish your goals. 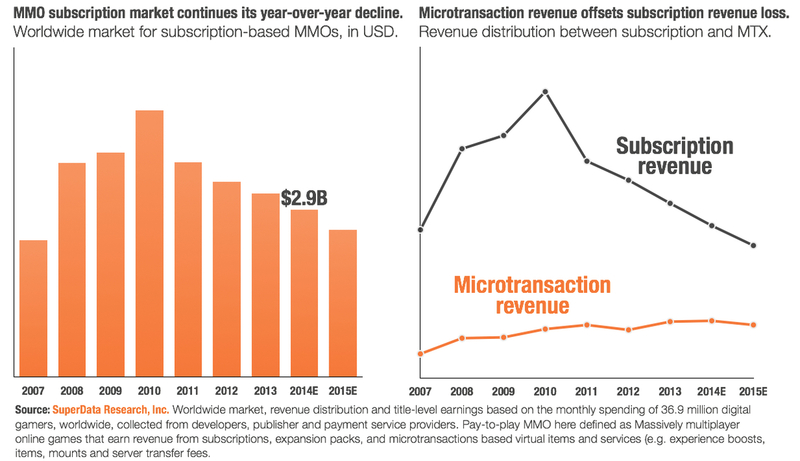 If the subscription market stabilizes, as Super Data Research predicts, what will that mean for the market? They report that console and PC gaming is picking back up and browser, social media and mobile is slowing down. The mobile market still has a large audience, but it, like free-to-play, is also becoming highly saturated. They do point out that WildStar and Elder Scrolls launching as subscription based challenges the status quo, because free-to-play has been taking over the market. A large number of titles have either fully moved to free-to-play, have free-to-play or subscription options, or at least a marketplace tie-in to allow for some type of microtransations to supplement lost of subscription income. What are your predictions for the market? Will we continue going down this free-to-play road or will we see a return to the subscriptions model? How do you feel about games, like SWTOR that offer both avenues? Do you prefer marketplaces that offer cosmetic only items or ones where you can buy anything you desire, including gear?